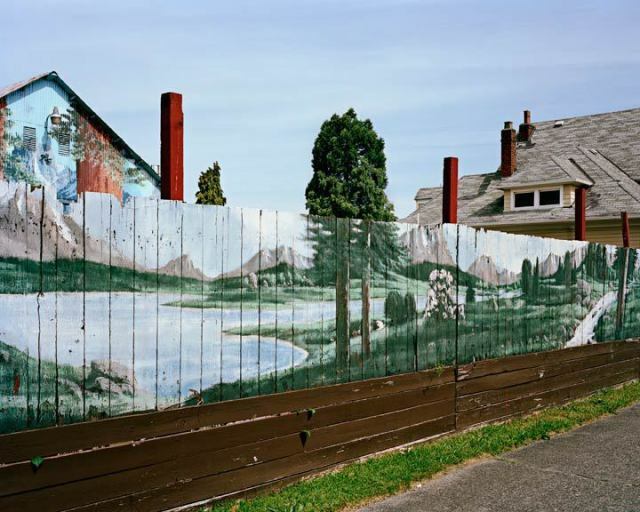 Adam Satushek, Fence, archival pigment print, 40 × 50 inches, 2010. Closing May 9 Isabelle Pauwels’s Incredibly, unbelievably/The complete ordered field, an exhibit of the Vancouver artist’s smart, edgy video projections that deconstruct reality TV and take on social issues such as gentrification. Pauwels was the first recipient of Henry Art Gallery’s Brink Award in 2009: in other words, she’s an artist who’s on the brink of something really big. Check out her work before she crosses the border, and find out more about the exhibit in Chris Werner’s interview of Pauwels. Closing May 8 Adam Satushek’s photography exhibit Annex at Platform Gallery. The UW grad’s photos distort reality by layering fantasy over the familiar, like a serene lake scene over a suburban plot of land, or bushes in the middle of a driveway. They explore our oft-hilarious, often tenuous relationship with our environment in order to help us understand our place in the world.